The most important fact to remember is that cold brew coffee and regular iced coffee are not the same. For instance, cold brew coffee is made by slowly stepping water for about 15-20 hours; this gives it a distinct smooth taste without any acidity. On the other hand, iced coffee is quick to make as you only need to add ice cubes into already made hot brewed coffee. Furthermore, iced coffee does not require a special coffee maker, whereas cold brewed coffee does. Otherwise, it simply will not be a cold brewed coffee. Moreover, fresh coffee beans contain various chemical compounds including many acids- among them is malic acid and furaneol. Brewing coffee is the process of gradually extracting these substances into water thus turning them into a delicious coffee drink.There are two important factors that need to be controlled; time and temperature. This is where the process varies greatly between hot and cold brew, as hot coffee heavily relies on the correct temperature, while the cold brew relies on time. Cold brew coffee is less acidic and mellower because oils and acids are simply not soluble in cold water. Also, cold brew coffee never tastes bitter or acidic because the low temperature does not oxidize them the way it does with hot brews. Takeya Deluxe cold brew coffee maker is made out of BPA-free glass with an airtight silicone lid that is resistant to mold and mildew. The pitcher is large enough to make four standard servings of cold brew coffee from most types of coffee beans. Also, the pitcher comes with a sturdy plastic handle that makes carrying the pitcher easy. Plus, the fine mesh filter keeps the coffee grounds away from the brewed coffee. Furthermore, the Tritan plastic parts of the pitcher are capable of withstanding high water temperatures. Also, the size of the pitcher is small enough to fit in most refrigerator doors so you can always drink your coffee cool. Customers can buy the Takeya Deluxe cold brew coffee pitches in two different sizes and 3 colors. Once brewed, you can keep the cold brewed coffee in this pitcher up to 2 weeks provided the pitcher is placed in the refrigerator. 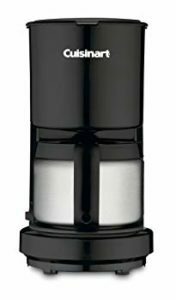 OXO Good Grip coffee maker is designed like a perforated rainmaker; this design helps distribute water evenly over the coffee grounds. It also helps provide optimal aroma and taste extraction. Moreover, customers have reported brewing extremely smooth coffee with low acidity in the comfort of their own house. 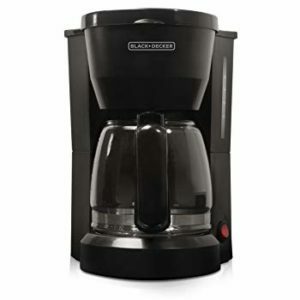 Plus, the OXO Good Grips coffee maker is enhanced with the Simple Brew-Release switch that allows easy control of the filtration process through the stainless steel and mesh filter. The filter can be reused after thorough cleaning under running tap water. 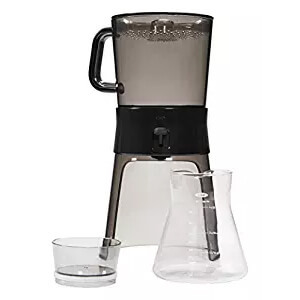 The glass pitcher includes clear measurements, a silicone stopper, and ten reusable filters. Also, it is very compact and can be stored away in the cupboard whenever it is not needed. Freedom Brew Company knows exactly how important it is to have a good mesh filter to brew the smoothest coffee with mild acid content. Hence, they have designed a super fine mesh filter that can be used to make up to 1 gallon of cold brewed coffee. The mesh filter can be strained back using the sturdy nylon strings to draw back the opening meant for coffee grounds. 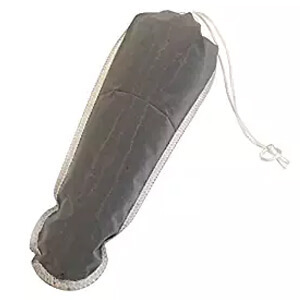 The mesh is made from durable, food-grade nylon that has been double stitched to ensure that no coffee grounds escape the filter and find their way into your cup of coffee. Moreover, this filter is 100% free from harmful chemicals such as DEHP and BPA (source). Plus, you can easily clean the filter by dumping the grounds in the trash can and then thoroughly rinsing the filter under running tap water. Bodum Chambord French Press has been designed to brew premium cold brew coffee in less than 4 minutes. Just add course coffee grounds, water and then press a button to make an aromatic and delicious coffee drink. 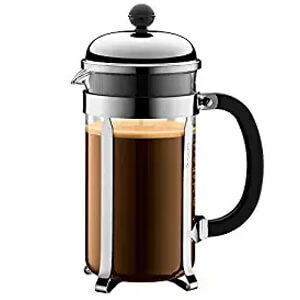 This French press is designed using a stainless steel plunger and a nylon mesh filter that aid in extracting the natural oils from the coffee grounds. 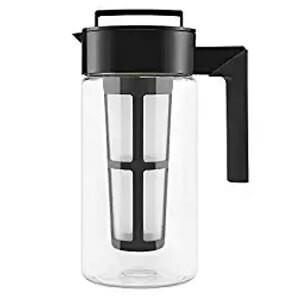 Moreover, the cold brew coffee maker features a patented Bodum silicone lid that will prevent the contents of the pitcher from leaking. Plus, it is easy to clean and can be placed on the top rack of the dishwasher and washed on a gentle cycle. 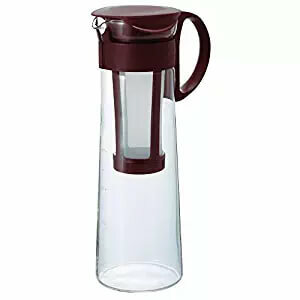 The pitcher is large enough to make 8 cups of cold brewed coffee at a time and can be purchased in eight different colors. Yama Glass ice water bulbs paired with the slow drip system ensures maximum extraction from any coffee grounds of your choice. 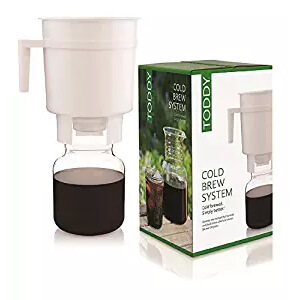 Regular cold brewing requires at least 24 hours for the coffee to be ready to consume, with this Yama coffee maker you can brew cold coffee in less than 5 hours. Moreover, customers have loved these cold brew coffee makers because they brew the smoothest coffee with minimum acidity level. 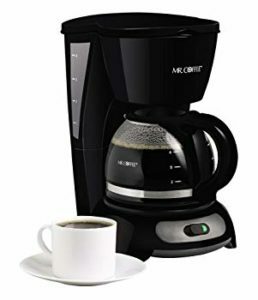 Plus, some local café chains have signed a multi-million dollar contract with the manufacturer for the production of these coffee makers, especially for the cafés. Furthermore, the handmade Borosilicate glass used in this pitcher is non-porous hence it does not absorb smells, color, or chemicals from the dish soap. The tower itself is made from 100% recyclable wooden parts that are carved by artisans using beautiful mid-century designs. 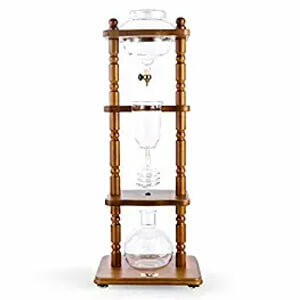 This cold drip coffee maker will fit right in your kitchen, office or even local café store. The Hario Mizudashi coffee pot is very easy to use and clean because it is made from stainless steel and reinforced glass (source). It makes about 1 liter of ready cold brewed coffee that will be enough to serve about 5 cups of coffee to your family or friends. The brown filter is easy to clean, however, it will need to be changed every couple of weeks to ensure no coffee smudges will be left behind on the bottom of the pitcher. Lastly, the glass used in this model is heat resistant and was manufactured in Japan specifically for this purpose. However, the instructions are written in Japanese, so it’s best to find a YouTube video to learn how to use it. This cold brew coffee system is very affordable and economical. 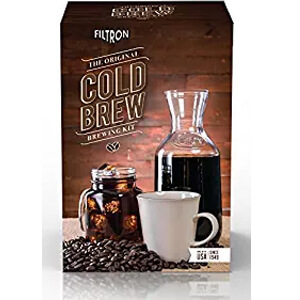 You can create coffee house style cold brew coffee in the comfort of your kitchen for much less than what a professional coffee maker costs. Toddy Cold Brew System uses patented technology to brew smooth coffee over regular beans with the intensity of nearly 67% and low acid level. Cold brew coffee made this way is much more sensitive on the stomach than usual coffee made in glass beakers. Also, this cold brew coffee maker does not use electricity. Therefore, it can be used on hiking or camping trips. Plus, you could brew enough coffee concentrate for up to 2 weeks without worrying if the coffee will change its aroma and taste. 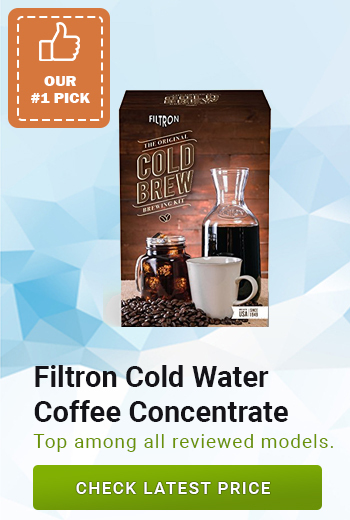 Filtron Cold Water Coffee Concentrate Brewer has been on the market for over a decade and it is loved by millions around the world. Plus, if compared to other similar models in the same price range then Filtron will surely win as it has a much more practical design. Moreover, it has a slimmer neck that makes gripping it easy as well as a lid cover that is leak-proof. The glass that the Filtron is made out of is much thicker, hence it is more resistant to scratches and breaking. 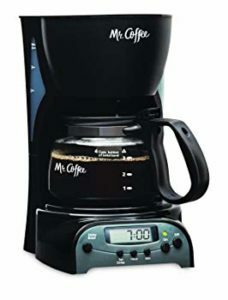 This coffee maker can also double as a hot coffee brewer and an ice tea maker. The body is easy to clean and store in the fridge. This coffee maker comes with an insulated and spill-proof mug that you can take with you to work, camping or anywhere else you need to go. 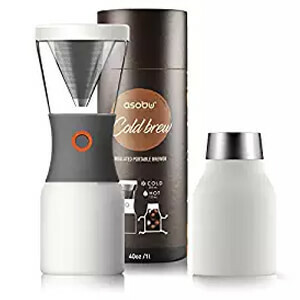 With this cold brew coffee maker, you can use regular medium course coffee grounds without getting any residue in your coffee as the fine mesh filter will filter out all the residues. 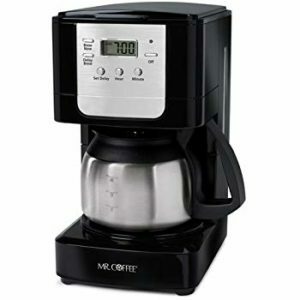 Moreover, you can find this coffee maker in four different colors and two different finishes. Plus, Asobu brews coffee in less than 24 hours and you can quickly drip it into the glass carafe with the press of a button. The stainless steel lid can be used to cover the mug when you take it with you outside or for a walk in the park. In general, there are two ways to make cold brew coffee- the slow drip and immersion. With the slow drip method, extremely cold water is gradually dripped onto the carafe with coffee beans. The main advantage of this process is the speed; cold brew coffee with the slow drip process will be ready to drink in less than 5 hours. The second method is the immersion process that is often favored by individuals brewing cold coffee at home. In the immersion process, the coffee beans are steeped for 12-24 hours in the cold water and are then filtered into a carafe through a stainless steel mesh filter. Moreover, your brewing method will largely affect what types of coffee beans will suit you. In conclusion, I would like to point out that the cold brew coffee maker you choose will largely depend on the amount of counter space that you have in your kitchen, how much time do you have for brewing and how much coffee you want to brew at a time.